Avoid the hassle of hunting for a parking space by letting a professional driver park for you, and avoid the hassle of washing your car by letting them do that too! I Love Valet Parking is rated, on average, 5 out of 5 by 6 Airparks customers. 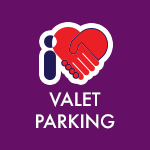 You can find the full reviews on our I Love Valet Parking reviews page. Get your holiday off to the right start by letting a professional driver from I Love Valet Parking worry about parking your car for you; they'll even give it a professional car wash before returning it to you when you get back! Head to the terminal forecourt where you'll be met by a professional driver, hand them your keys and they'll look after your car while you stroll the short distance to check-in. The best thing about Valet Parking is that you are already at the airport - no need to worry about transfers at all. Your car will be brought back to the forecourt when you return so you can just hop in and head home - and it will have been cleaned for you!